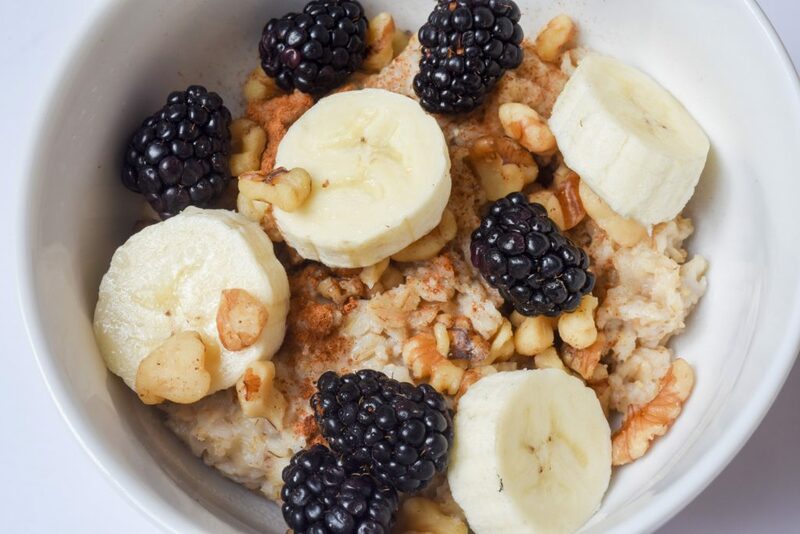 This recipe calls for steel-cut oats, but can also be made with old-fashioned or rolled oats which have a quicker cooking time (about 5 minutes). If using steel-cut oats, save time by making a large batch on Sunday and keeping the leftovers in the fridge to reheat small batches throughout the week. This will give you a delicious and convenient breakfast option all week long. Reheating tip: Add ¼ cup of milk to each 1 cup batch of cold oatmeal, heat in the microwave for 1 ½ minutes or on top of the stove for 3-4 minutes, and stir before eating. Feel free to substitute the bananas, blackberries, and walnuts with your favorite types of fruits and nuts. Prepare oatmeal according to package instructions. If desired, add salt while cooking. Add nuts, fruit, and cinnamon to prepared oatmeal. Enjoy! I have been making steel cut oats like this for at least a couple of decades. I always add cinnamon and cardamom, as well. My go-to nuts for this recipe are almonds or walnuts. My usual fruit choices are some type of berries or apple slices. I usually eat this 3 times per week for breakfast or lunch. It is so delicious. I make a big batch and take off chunks to heat in the microwave topped with your choice of a bit of liquid. Thank you Dr. Dunn for your recent well done presentations to Osher Lifelong Learning Institute members in Raleigh. I am enjoying this website and find it quite useful.